US broadcaster Fox has apologised to viewers for the offensive gesture Robbie Williams gave during his World Cup opening ceremony performance. "As it was broadcast live, we did not know what would happen during [the] performance and we apologise," the network told the Hollywood Reporter. Neither the Take That star nor his representatives have explained why he showed his middle finger. The incident was not seen by UK viewers but has been widely circulated online. ITV had already cut away from the opening ceremony when Williams "flipped the bird" while singing his 2000 track Rock DJ. The 44-year-old altered the lyrics from the song, adding the line "But I did this for free" before giving his one-finger salute. Robbie's gesture, potentially seen by millions around the globe, recalled the middle finger MIA gave to the camera while appearing with Madonna at the 2012 Super Bowl. 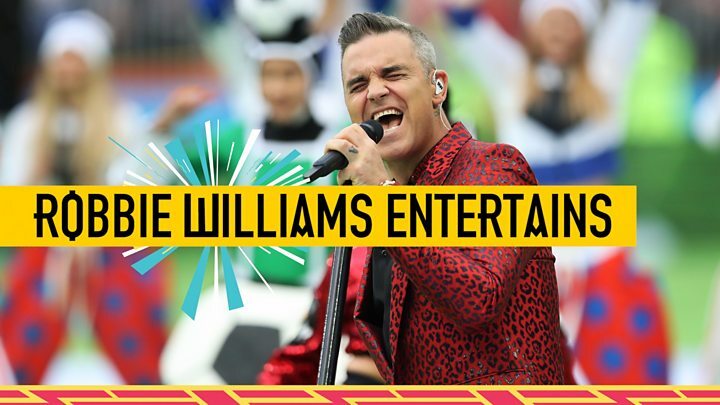 Williams had previously tweeted that he was "very excited to be returning to Russia to perform at the opening of the @FIFAWorldCup". Yet he did admit, in an interview with Reuters, that he had been asked not to sing Party Like a Russian, his 2016 song about hedonistic Russian oligarchs. The track prompted some Russian media outlets to call for him to be banned from performing in the country. Robbie's performance began with Let Me Entertain You and included his songs Feel and Angels, which he performed with Russian soprano Aida Garifullina. It preceded the opening match between Russia and Saudi Arabia, an uneven contest that Russia easily won five goals to nil.